Expect an extraordinary experience at Gaylord Opryland Resort & Convention Center, boasting stylish rooms and modern meeting spaces. This hotel features 9 acres of lush, indoor gardens and cascading waterfalls. The hotel offers abundant access to dining, shopping, and recreation options. Take a ride on the Delta Flatboat through the indoor river, or treat yourself at Relache Spa, and break a sweat at the fitness center. The resort numerous many events and shows for all ages through the year. 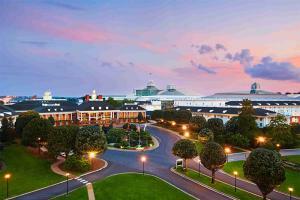 Nearby popular attractions include the Grand Ole Opry and Country Music Hall of Fame.